I had browsed a particular vendor's site for years, being on the fence on whether to buy. Last week, Ira mentioned she got one of the best deals on Golden Needle White Lotus ever from this vendor. So I gave them another look. My eyes needed only three milliseconds to zoom in on this deal. I was really curious what kind of 2000 Red Label Dayi goes for only $74. Shu of course. But if it is what it says it is, it's a mouthwatering discount even as a shu. The vendor had only that tiny little image of the wrapped beeng. Of course being a bargain shu hunter, I immediately had a Pavlovian response to that particular shade of background tan, there is only one place I need to head to solve the mystery. Yup. That shade of tan could only belong to tuochatea.com- my supplier of dirt-cheap legit factory shus. When you click on the description, I see that it was going for $10.4 a beeng or $69 a tong! Where was I back in 2006? I only turned to tuochatea in August 2007 after I was no longer able to drink sheng and Yunnan Sourcing's shu's were getting too pricey for me by which point these goodies were long sold out. 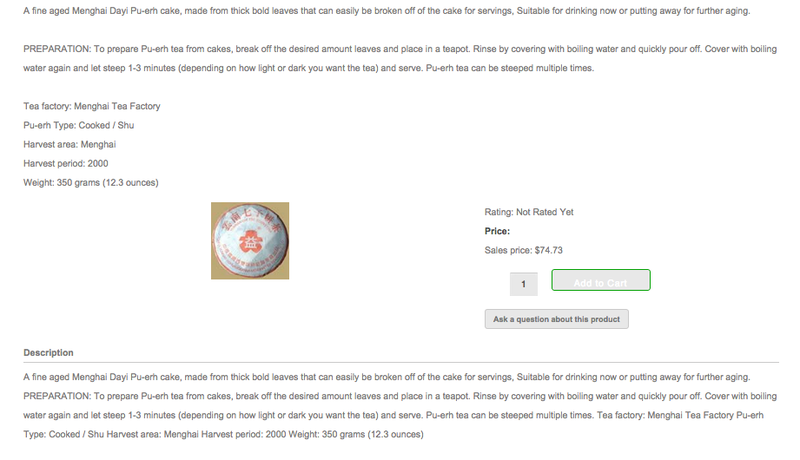 You can see in 2006 that tuochatea did not have a vintage specified or even a recipe number. What totally excited me about the description was the phrase "deep red orange infusion" which could indicate a lesser fermented shu. But by late 2007, tuochatea had labeled the vintage of this Red Dayi as being 2000 and even changed the description altogether. BTW, that 2004 Haiwan LTZ on the left I forked over $19.60 back then(and how indignant I was at paying such prices for shu) is now going for $69 at teaclassico. Their version is a more humid Guangdong stored version- does shu need or get more interesting with further humid storage? 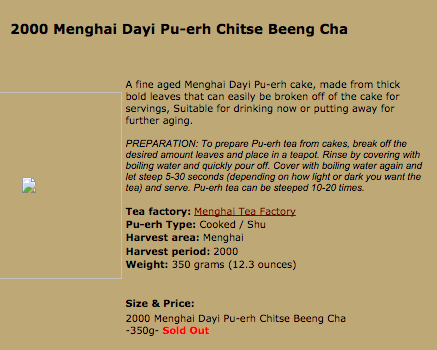 "A fine aged Menghai Dayi Pu-erh cake, made from thick bold leaves that can easily be broken off of the cake for servings, Suitable for drinking now or putting away for further aging." Yup it's copied word for word on the vendor site. Tuochatea is a pretty legit business, and I've gotten authentic Dayi shus from them. There's some circumstantial evidence to indicate that this other vendor's Dayi is from tuochatea. 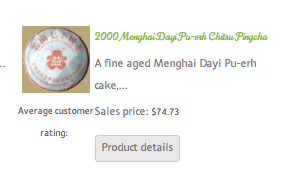 Although when I called them this morning, the vendor mentioned that this cake was bought from Yunnan Sourcing. So if that is the case, then it's also highly likely this is real Dayi. So after all this research, I tried to buy up 4 cakes. But he only had one more left which I bought up. I haven't received it yet. With these early undated Dayis, the faded orangish red wrapper with the rounded tae tae symbol indicates it could be dated anywhere from 2000-2004. I was scrutinizing tuochatea's unwrapped beeng shot from 2006 left and right yesterday for any hints of aging- I think the compression is unusually loose with the edges frayed for it to be only a 2004. Only by some measure of taste, we might make a better guess. Stay tuned! wayback machine is great. Hou De is another one worth browsing on there - they had some really cool teas in the past. one that stood out to me was a 70's tuocha...an oolong tuocha. Wish I could have tried that, just for the novelty. The R trademark seems wrong in all these photos, too high off the trademark point. http://www.puerh.fr/en/article/red_da_yi.htm Like you I would stew over these things but to the point of OCD. 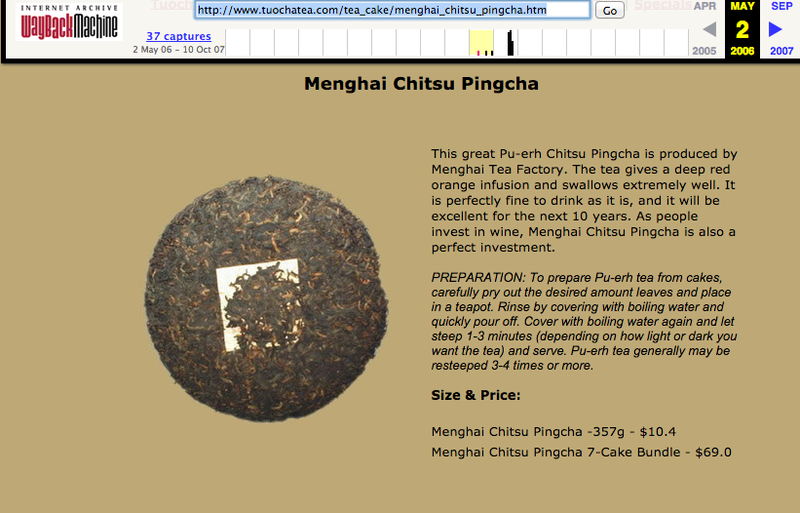 I'd rather just buy a white label from a decent vendor or an obvious fake, but puerh is all about the fun either way. Looking forward to hearing more.